Whenever I'm not busy with my important daily duties like eating & sleeping, I surf the Web in search of places of interest to fellow kitties. I've met some really nice folks, & some of them have been kind enough to present me with awards. I've also joined some neat clubs & web rings. If you have a little time, why not drop in on some of these sites! Thanks to all the nice folks who have presented awards to my site, this page was taking FAR too long to load. 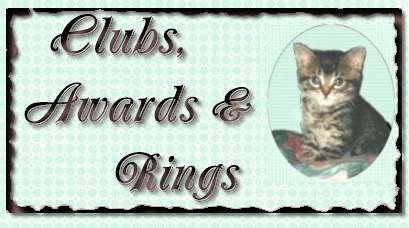 I've moved the awards to separate pages, & you can view them by clicking on the links below. We really appreciate each & every one, & hope you'll take the time to visit the terrific folks who gave them to us. Awards I won when my site was hosted by Geocities. site is owned by Tigger. 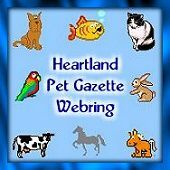 This Heartland Award of Excellence winning site is owned by Tigger's Cat Tales. 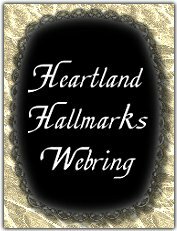 Are you interested in winning the Heartland Award of Excellence??? Follow the link to find out how! 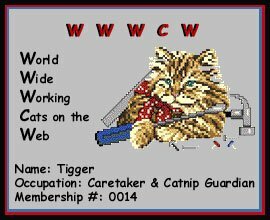 This Petsburgh Post WebRing site owned by TIGGER. 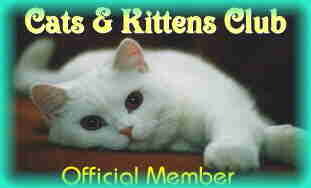 My background set was made by my purrson Click on the graphic to see more!